Oh, Martha, you fabulous domestic goddess, is there anything you can’t do? 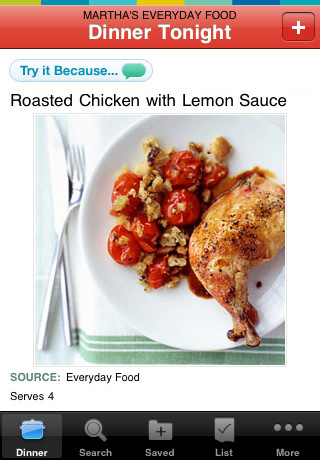 When life gives her lemons, she manages to make a pan-seared lemon herb chicken with lemon meringue parfaits and thyme-flavored lemonade, and then makes the recipes readily available for you on the iPhone! If you’ve spent any time around a home kitchen in the U.S., you’ve probably encountered Martha’s influence somewhere. Her recipes have a way of spreading like wildfire, thanks to her very popular TV shows/magazines, Martha Stewart Living and Everyday Food, and this new app brings the doyenne of domestic divahood straight to your iPhone. With a strong focus on simple and fresh home cooking for the family, Everyday Food is pretty much exactly what it promises to be, an all-purpose digital cookbook for everyday use. Recipes are generally on the easy side, but they do skew slightly fancier than, say, the Betty Crocker recipes. Unlike the Betty Crocker app, however, Martha’s recipes aren’t pushing particular products down your throat. If you don’t like trying to come up with dinner ideas, Martha’s got your back with daily recipe recommendations, and compiling a grocery list is easier than pie, thanks to integration with their affiliate site, Ziplist. 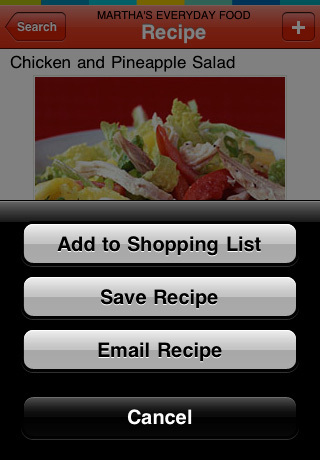 With the list function, you can add ingredients from recipes, scan barcodes for products you need to replace, and even divide up lists by store. If you have a Ziplist account, you can even share the list with other members of your household and spread the errands around, but even if you don’t, you can still easily share via email. Unfortunately, the rest of the app’s functionality isn’t nearly as perfect as Martha’s homemade cookies. In fact, it’s plagued with some serious problems. The search feature in particular is much slower than I expected, and the interface is liberally peppered with ads, near unforgivable in a paid app. Although there are a large number of recipes available, you need 3G or wifi access to reach them, and the app suffers from some major stability issues that result in the app crashing all too frequently. I’m not really the happy homemaker type, but I do love to cook and had high hopes for Martha’s Everyday Food, but she seriously let me down. To be fair, the recipes are still good and for $0.99, I’m not expecting the moon, but it’s disappointing all the same when you realize the Epicurious app is free and much better. 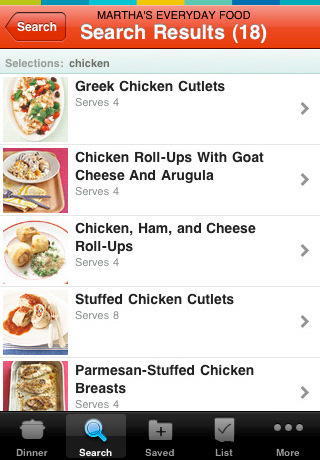 AppSafari review of Martha’s Everyday Food: Fresh & Easy Recipes was written by Tracy Yonemoto on September 14th, 2010 and categorized under App Store, Food, Reference, Shopping. Page viewed 5929 times, 1 so far today. Need help on using these apps? Please read the Help Page. Good article. Another recipe favorite of mine is Coke chicken, its one of the yummiest i have ever had.